Please review the REU projects and research interests of the REU faculty mentors listed below. Select five faculty members with whom you would like to work. There is no guarantee that you will be matched with your top choice, if selected for participation in the program, but every attempt will be made to accommodate your interests. One major project in our lab focuses on development of new classes of chemical crosslinkers with greatly improved characteristics for mapping protein complexes and characterizing unknown protein structures. These tools have been applied to several large protein complexes (including Hsp70 complexes, GRASP55, and MLL1) and are being extended to whole mitochondrial and Golgi membrane protein complexes. The long-term goal of this new research project is to determine the dynamics of protein interactions in vivo to better understand cell processes and to identify druggable interaction sites. More broadly, our research focuses on systems analysis and protein structures through mapping protein interactions and how they are modulated by post-translational modifications. A continuing effort of our laboratory has been development and application of computational methods in proteomics and the application of new chemistries and techniques in structural mass spectrometry. 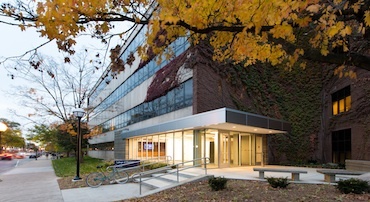 Recent work in the Andrews’ laboratory has focused on the molecular architectures of organelles (and how they change with physiology), methods for quantitative proteomics (including phosphoproteome and histone post-translational modifications), approaches to improving interaction maps, computational methods for analysis of proteomics data, and mapping solution-phase changes in protein structure. Our lab collaborates with a number of other groups to elucidate cell control pathways. Writing programs to measure physical properties of the bound complexes in MOAD and comparing the trends to binding affinity data. Others have mined the PDB for trends, but never before has the community been able to compare the trends to learn their true effect on binding affinity. Trends include degree of buried surface, quality of complementary surface matching, and the volume/volume ratio of the ligand to binding site. Examining the role of bridging water molecules in the hydrogen - bonding network of the binding site. Measuring side-chain reorientation and backbone movement upon binding different ligands. Examining receptor flexibility and induced-fit issues by examining collections of the same protein binding different ligands (multiple protein structure, MPS, techniques). We can also use MPS to push ligand discovery into new chemical space to find new substrates or inhibitors with different sizes and shapes or to study allosteric control in proteins. A relevant student project would be to use MPS to determine which amino acids transmit information from one binding site to another. We work closely with fellow REU Faculty Mentor, Prof. Jason Gestwicki, who can validate our predictions. Students with interests in this project would need a strong foundation in mathematics e.g. advanced calculus or differential equations. Prior experience in computer programming is not required. Chemical synthesis is a primary tool in the invention of medicines and biochemical probes. A large amount of data must be collected and interpreted in the chemical synthesis step and in the product characterization step. Our lab uses data science and high-throughput chemical experimentation techniques to navigate this near-infinite reaction space and chemical space in the hunt for new drugs. We look for unanticipated patterns and trends in reaction data, and use our findings to develop new reactions of importance to medicinal chemists. The Cernak Lab is outfitted with robotics and other tools for organic synthesis, high-throughput experimentation, high-throughput analysis and data analysis. Students typically learn cutting-edge techniques in these areas and should expect to run both wet chemistry experiments and computational informatics studies. Talented undergraduates hone their skills in modern chemical synthesis, high-throughput experimentation, automation and data science. REU students typically work towards the invention of a new chemical reaction that would be impactful in drug discovery. Vaccination has made a major impact on global population health; it has controlled more than a dozen of human diseases. However, the time currently needed for the launch of new global health vaccines is too long and the failure rate during the late stage of development is unsustainably high. As a consequence, substantial time and investment usually went into the development of a vaccine yet the result is often uncertain. Even though the vaccines are available, in many cases, the molecular basis that underlines their immunogenicity is not clear. We are interested in identifying the molecular basis of immunogenicity and applying this knowledge to the formulation of a vaccine. Our past work on HIV-1, the causative agent of AIDS, and comparison with other known viruses with licensed vaccines have led us to propose a model that a threshold density of viral surface antigens might be required for optimal immunogenicity. The goal of this project is to explore the fundamental principles in B-cell recognition of protein antigens and utilize these principles for more effective delivery of antibody-based vaccines. Membrane traffic is essential for the normal functioning of our bodies, because maintains the proper functioning of many membrane bounded organelles, including the plasma membrane, Golgi, ER, and lysosome. Importantly, it is the mechanism by which cells can control the content of their plasma membrane, which is important for many processes including cell communication, adhesion, and migration. The Duncan lab studies the proteins that are important for membrane traffic using a combination of genetic, biochemical, and cell biological approaches. One currently available REU project looks at components of a conserved complex that is required for membrane traffic. This project will include structure-function analyses in vivo and in vitro to map functionally important regions of the protein and physical interactions between the complex subunits. A second project looks at a novel protein inhibitor of type V myosins. Students will be involved in testing specific protein-protein interactions using recombinant proteins. Techniques learned will include yeast and bacterial culturing techniques, molecular genetics including generating mutant alleles and fluorescently tagged proteins, recombinant protein purification, and fluorescence microscopy. Excess body fat accounts for 25-50% of many frequent cancers, including breast, liver, colorectal and pancreatic cancers. As obesity and diabetes have reached global epidemic status, affecting nearly 1 billion and 250 million people, respectively, worldwide, there is a great need to investigate links between these diseases to validate new targets for drug discovery efforts. The research program of the Garner laboratory focuses on targeting mRNA translation initiation, as derangement of this step in protein synthesis has been implicated in both cancer and metabolic diseases. Importantly, this line of investigation should allow us to further understand druggable connections between cancer, obesity and diabetes. To tackle this challenge, the Garner laboratory uses a variety of chemical biological approaches including the development of chemistry-inspired assays, small molecule library screening and cellular imaging, in addition to chemical synthesis. An REU student can expect to be exposed to techniques drawing from organic chemistry, biochemistry and molecular and cellular biology. The extracellular matrix is a complex and dynamic compartment that provides structural support and essential signaling functions to the cells it surrounds. The plant extracellular matrix is composed of a complex interlocking system of different polymers including cellulose, the major load bearing polymer; hemicelluloses which reinforce the cellulose fibrils; pectin which helps regulate wall hydration; and a large and diverse group of structural glycoproteins whose function remains poorly understood. The MacAlister lab uses genetic, molecular and imaging techniques in several model plant species to study the role of these cell wall-associated proteins during plant development. The structure of the cell wall has important physical consequences for cellular function. Consequently, wall composition varies between cell types and taxonomic groups. This project will focus on a small sub-group of cell wall proteins specific to the Solanaceae plant family which includes tomato, potato, pepper, petunia, tobacco, eggplant and other economically important crop plants. Preliminary data indicates that the members of this protein family are expressed in specific tissues during plant development, particularly in the flower. This project will focus on generating fluorescent reporters of gene expression and protein localization for these family members and generating loss of function mutants and characterizing their phenotypes. Altered transcriptional patterns are associated with all human diseases, either as a cause or as an effect. For this reason, molecules that interfere with or promote protein-protein interactions within the transcriptional machinery are attractive targets for therapeutic development and as mechanistic probes. Only a handful of such molecules have been reported, however, due in large part to the still-limited understanding of the mechanism of transcriptional regulation. The Mapp lab uses a combination of synthetic, biochemical, and cell biology approaches to develop a molecular-level picture of key protein-protein interactions in transcription initiation and use that information to design small molecules that mimic essential features of transcription factor structure and function. Current REU projects include using in vivo cross-linking to discover key protein-protein interactions that lead to a gene being turned on and using NMR spectroscopy to study the conformational changes in transcriptional proteins induced by small molecule transcriptional activators. An REU student will learn a variety of techniques from organic synthesis to protein expression to protein NMR. The research focus of Nikolovska-Coleska’s group is discovery, design and development of small-molecules as new molecularly targeted therapies for cancer. Molecularly targeted therapy is a treatment that aims to interfere with the function of the biological pathway within the cancer cell that is critical to its growth or survival. By targeting a unique characteristic of the tumor, cancer cells will be specifically killed, providing effective cancer treatment with significantly fewer side effects. We use different strategies to identify new hits and lead compounds, such as high throughput screening, virtual screening and structure-based design. One of the current lab focuses is targeting protein-protein interactions involved in programmed cell death and we are working on developing small molecule inhibitors of myeloid cell leukemia-1 (Mcl-1), a potent anti-apoptotic molecule, member of the Bcl-2 family of proteins. Mcl-1 has been found to be overexpressed in both solid and non-solid tumor cell lines and human cancer tissues. Consistent with its anti-apoptotic function, overexpression of Mcl-1 has been associated with tumor initiation, progression and resistance to current anticancer therapies. Our lab has identified several lead compounds and currently we are optimizing these compounds through a structure-based drug discovery approach supported by experimental structural biology, molecular modeling, chemical synthesis, and biochemical and biological in vitro and in vivo evaluation. The second focus of our research is in epigenetics modifications which play an important role in human cancer. Particularly we are interested in protein-protein interactions that underline the histone modifications, specifically histone methylation and elucidating the biological role of histone lysine methyltransferases (HKMases). For this purpose we have biochemically characterized the protein-protein interactions between Dot1L, a K79 specific histone lysine methyltransferases and MLL-fusion proteins using surface plasmon resonance (SPR). Mutagenesis and structural characterization of these protein-protein interactions are underway. By applying a chemical screening approach we have identified molecules that inhibit enzymatic activity of Dot1L. Using these chemical probes as pharmacological tools, we are performing different cell-based functional assays in order to further elucidate and understand the function of Dot1L and its importance in leukemia. The REU student could be involved in either of these two projects based on his/her interest. The REU student will be exposed to and learn a variety of techniques from organic synthesis, complementary biochemical (fluorescence polarization based binding assay, tritium scintillation proximity enzymatic assay) and biophysical assays (SPR and NMR), functional and cell based assays using different human cancer cell lines for validation and characterization of new small molecule inhibitors. Pyrimidines are vital, not only for the synthesis of nucleic acids, but also for the synthesis of complex carbohydrates, glycoproteins, and glycolipids. Pyrimidines are synthesized de novo from aspartate, ammonia, bicarbonate, and ribose in a six-step sequence. Dihydroorotate dehydrogenases (DHODs) catalyze the only redox reaction in de novo pyrimidine biosynthesis. There are three phylogenetic classes of DHODs, but the structures of the active sites are nearly identical in all. We have discovered that, surprisingly, certain hydroxybenzoates inhibit Class 1A DHODs but not other DHODs, despite the near-identity of the ligand binding sites. The origin of this extreme molecular discrimination is at the moment mysterious. Based on our previous kinetic, spectral, calorimetric, and crystallographic studies, we hypothesize that the pK of the phenolic group of the inhibitor is an important determinant of affinity. Therefore, in this project, hydroxybenzoates substituted with fluorine will be synthesized by a sequence using a standard chemical reaction followed by enzymatic hydroxylation. The fluorinated compounds will be tested for binding in spectral titrations with the enzyme and for inhibitory power by steady-state kinetics. The ionization state of the enzyme-inhibitor complex will be determined by 19F_NMR. The rates of association and dissociation of the inhibitor will be determined in stopped-flow experiments. This project will provide a student with a broad range of research experiences, including bacterial growth, protein purification, organic synthesis, transient and steady-state kinetics, and spectroscopy. The results from this project will be an important contribution to our studies on molecular recognition by DHODs. Our genomes are under constant attack from endogenous and exogenous sources of chemical damage. Fortunately, many pathways exist to survey genomic DNA, remove chemical lesions, and restore the original sequence. Failures in DNA repair can cause a wide variety of diseases, including cancer and neurodegeneration. Therefore, a molecular understanding of DNA repair pathways is critical for understanding disease risk and recent progress is leading to novel strategies to treating diseases such as cancer. REU students have the opportunity to learn biochemical and biophysical approaches to studying enzyme mechanisms and specificity in protein-protein and protein-DNA interactions. Specific projects are designed based on the interests of the student and on the feasibility in relationship to current research in the lab. Past student projects have developed new biochemical assays, characterized new small molecule inhibitors, and determined catalytic specificity and chemical mechanism. The efforts of the Ragsdale laboratory focus on studying the roles of metallocofactors in the structure and function of proteins. In several projects, we are studying the catalytic role of metal-containing cofactors (vitamin B12, heme, a nickel-tetrapyrrole, iron-sulfur clusters). The processes that we study involve key microbial reactions in the global carbon cycle (carbon dioxide fixation, methane synthesis, carbon monoxide metabolism). We also are determining the mechanism of mercury methylation. In another project we are determining how heme is used to regulate metabolism and the circadian rhythm in mammals. REU students have the opportunity for training in a wide array of biological and biochemical skills involving the culture of diverse microbes or human cells; performing protein purification; measuring enzyme activity and spectroscopic analyses; making and characterizing site-directed variants of proteins. My laboratory studies the transport of small bioactive molecules within single living cells using a multidisciplinary approach spanning high throughput microscopic imaging, machine vision, biochemical analysis, chemical genomics, mathematical modeling, and cheminformatics. The goal is to elucidate the relationship between the chemical structure of small molecules and their intracellular distribution, while developing methods for optimizing intracellular transport properties of small molecules by introducing chemical modifications into said molecules, to impart favorable subcellular distribution properties. These studies are essential to our understanding of how cells interact with toxins present in the environment, as well as how cells transport nutrients and rid themselves of metabolic waste products. Specific research projects center on studying cellular transport properties of small molecules, and developing methods to quantitatively assess the mass or concentration of small molecules in different subcellular compartments at different times after cells are exposed to chemical agents, as well as visualizing microscopic imaging data. Small molecule transport can be easily and safely monitored semiquantitatively using microscopy. Undergraduate students participating in the REU program will be paired with graduate students in the lab, with whom they will learn the basics of microscopic image acquisition, analysis and display techniques that are used to elucidate the subcellular accumulation of fluorescent drug-like molecules. They will also study the mechanisms by which small molecule drugs can precipitate inside cells, and will study the interaction between drug crystals and biomolecules in the context of drug discovery and development. The Satin lab is interested in understanding the cellular and molecular basis of insulin secretion from pancreatic beta cells in both healthy and diabetic animals, and islets from humans. Our unique focus are interactions between ion channels of the beta cell plasma membrane and fuel metabolism of the beta cell. Our work on interactions of metabolism and ion channels includes the development of novel genetically encoded metabolic sensors for glucose metabolites, intracellular ion measurements, metabolomic analysis, and studies of genetically modified mice, as well as human islets. We have new work underway that seeks to understand how the function of beta cells in response to insulin resistance may in turn alter the mass of beta cells capable of secreting insulin. We are also interested in understanding how abnormalities in endoplasmic reticulum calcium levels contribute to ER stress, and the impact of ER Ca changes on various protein folding diseases, of which diabetes is one example. We are also studying gap junctions and their role in beta cell to beta cell communication within the islet. Our overall goal is to improve our understanding of the cellular mechanisms controlling oscillatory insulin secretion, and to improve the treatment of diabetes through the development of new drugs targeting the stimulus-secretion coupling pathway. High density lipoprotein (HDL or "good" cholesterol) works by removing excess cholesterol from macrophages in plaques and transporting it to the liver for elimination. Artificial HDLs nanomedicines, hyperbolically called “Drano® for the arteries”, are being tested in clinical trials. The HDL is a natural nanoparticle (10 nm in diameter) composed of apolipoprotein A-I and phospholipids. The objective of this research project is to understand how the size and lipid composition of HDL affects its cholesterol binding properties and, therefore, its potency in cell culture and in animals. Undergraduates will examine protein-phospholipid binding efficiency by titration micro-calorimetry and prepare a variety of HDL nanoparticles. HDLs will be analyzed by chromatography, particle sizing methods, gel electrophoresis and microscopy. The affinity of HDL nanoparticles for cholesterol will be determined by micro-calorimetry and fluorescent spectroscopy, and tested in cell culture. Undergraduates will learn a variety of useful research methodologies and participate in designing novel efficacious and safe HDL nanomedicines for treatment of patients with heart disease. Drugs and other small molecules foreign to the human body are broken down by cytochrome P450 enzymes. The Scott lab works to understand how real-world pharmaceuticals and toxins are cleared in vivo, largely by probing how the structures of individual P450 enzymes do (and don’t) complement different small molecule scaffolds. This work involves generating human P450 enzymes in the laboratory and employing them in diverse biochemical and structural biology experiments. Diverse enzymatic assays are used to determine which P450 enzyme(s) metabolize which drugs, how readily, and how easily this clearance is negatively impacted by other small molecules to which we are exposed. REU students are also exposed to, and may participate in, the application of X-ray crystallography and protein NMR techniques for determining the structures of P450/ligand complexes that iteratively help understand the metabolism of new drugs and redesign existing drugs for improved metabolism. The efforts of the Sherman laboratory to isolate novel marine bacteria involve field collection of sediments, sponges, and other invertebrates (bryozoans, ascidians, soft corals, tunicates) from the Indo-Pacific and eastern Pacific regions. Sediments provide a rich source of diverse actinomycetes that are yielding new biological activities and natural products. Based on our findings that novel classes of microorganisms that produce important secondary metabolites are being discovered from marine sources, it is clear that there is exciting new information to be learned from these novel organisms at the genetic and biochemical levels. Talented undergraduate students are trained to acquire a diverse set of microbiology skills that include developing new conditions and media for growing diverse forms of marine bacteria. As pure cultures are obtained, their research experience develops to include phylogenetic analysis of the microorganisms using 16S rRNA gene sequence analysis, cell wall composition and fatty acid analysis, menaquinone characterization and genome fingerprinting (RFLP analysis). In addition, those students that are interested in chemical aspects of microbiology participate in large scale culture, extraction, fractionation and purification of biologically active natural products. Our lab employs interdisciplinary approaches (imaging, microfluidics, modeling) for a quantitative understanding of self-organizing behaviors of single cells and single molecules during early embryo development. By connecting the understanding at the molecule, cellular, and tissue levels, we pin down the physical mechanisms that give rise to collective spatio-temporal patterns that arise from complex interactive networks of cells and molecules through biochemical signals and mechanical forces. Interested students are encouraged to contact me (qiongy@umich.edu) and to visit our webpage (www.umich.edu/~qiongy) for more details.